Although videos and instruction books on T'ai-Chi are widespread and may be helpful as an introduction to the art; for the study of T'ai-Chi, it is recommended to take a class with an experienced teacher. Beginning classes at the Birthing Life T'ai-Chi Center teach fundamental postures that lower the body’s center of gravity and free the arms and legs to flow like ribbons. For example, finding the “ridgepole,” which starts from the crown of the head and hangs straight down through the tailbone, helps align and “root” the body with the earth. Students also practice simple Qi Gong exercises that help open consciousness to the movement of chi, or life energy, in the body. Students then learn the T'ai-Chi form, a series of martial moves that the class can practice together as a group. Each move is expressive of an animal, such as “snake creeps down” or “repulsing the monkey.” Since the power of a strike, block, or kick is supported by chi, their effectiveness is not dependent on physical strength. Advanced classes also incorporate push-hands—slow-moving, dance-like sparring with a partner. Students deepen and personalize their experience of the form in their own practice. To practice T'ai-Chi, only about four feet square of floor space in a quiet area is needed. Students may play non-rhythmic background music or light incense to make the space more pleasing. A typical practice may vary in length, but five to 10 minutes is enough for one’s body and mind to relax and feel centered. Students not only practice at home, but also at parks, workplaces, and health clubs. 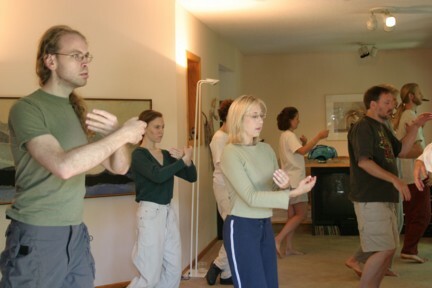 T'ai-Chi is complementary with other movement and meditative practices, such as yoga, Pilates, sitting meditation, weightlifting, and other martial arts. People with movement limitations or injuries find that practicing T'ai-Chi can provide a gentle, but invigorating exercise. The form movements also enhance one’s awareness of everyday activities, such as walking, opening doors, and bending the legs to pick up heavy objects. A regular practice keeps one connected with the wisdom of the body, helping remain calm and centered in chaotic times.